Newly appointed Assistant Conductor Marcelo Lehninger made his BSO debut in Symphony Hall on Thursday evening, October 21, at the opening concert of a series featuring works by Barber, Beethoven, and Tchaikovsky. 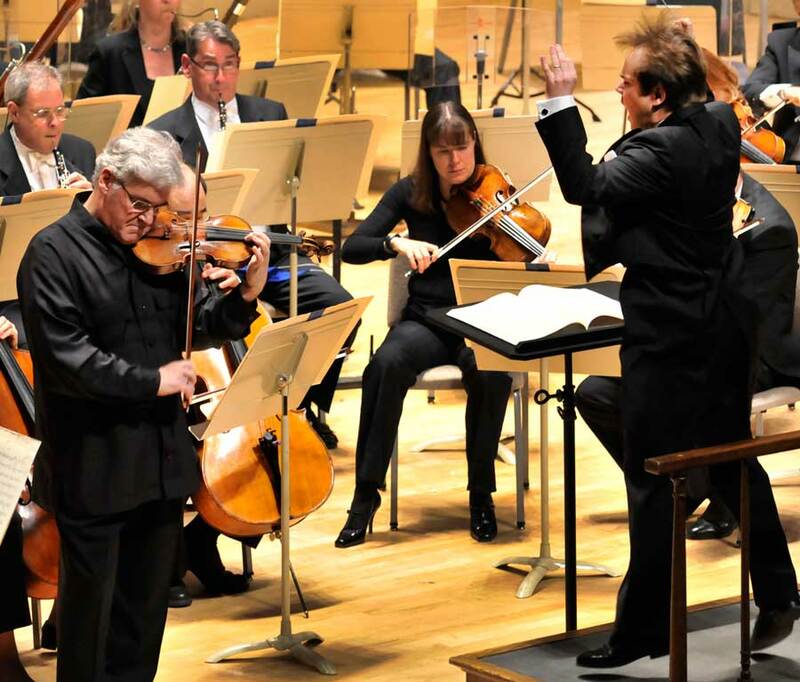 The program featured soloist Pinchas Zukerman for Beethoven’s Violin Concerto in D, Op. 61. Considering the current circumstances of the Orchestra, audiences have a higher-than-usual investment in the ability of the new Assistant Conductors. And Lehninger’s debut was undoubtedly met with a meticulous eye. Across the entire program, audience response was overwhelmingly positive, and Lehninger’s conducting was assured and unfaltering. Barber’s Overture to The School for Scandal opened the program with a sort of modest brilliance that can only be found in the music of Barber. While the non-overture is far from a masterpiece, knowing that it was indeed the composer’s first work for orchestra speaks volumes to Barbers genius. The woodwinds are given a prominent role, and the playing of oboist John Ferrillo and clarinetist William R. Hudgins was particularly noteworthy. Lehninger brought out the quirky moments of the piece with charm, and navigated the swift tempo changes and juxtaposed moods with ease. The piece is a short one, and lead into the much more well-known masterpiece, Beethoveen’s Violin Concerto in D.
Despite having the stage-presence of a rock, Violinist Pinchas Zukerman is a virtuoso with a magnitude of musical sensitivity. The opening movement had some brief awkward moments, but the virtuosity displayed in the first cadenza left nothing to be wanted. The sheer power that Zukerman is able to produce in an otherwise silent hall is beyond me, and, I presume, beyond most violinists. But his real strongpoint is his lyricism, and for this, the Larghetto contained the most effective moments of the concerto. The Rondo was performed masterfully as well, opening up more acrobatic dialogues between the soloist and the orchestra. The dynamic conclusion of the violin concerto was greeted with a standing ovation. Tchaikovsky’s Symphony No. 5 is a visceral and powerfully dynamic beast that gives any orchestra the chance to show its muscle, and is programmed often because of this. That the orchestra is able to create such an immaculately cohesive wall of sound is enough to remind even the patrons in the furthest rear corner why they bought their tickets. Lehninger showed particular care for the details – particularly in the shapely swells that gracefully close off melodic lines in the Andante cantabile. While the Valse left something to be desired in terms of the longer line and was not quite as elegant as it could have been, adrenaline was poured from every inch of the stage into the Finale. Of course, both the Tchaikovsky and the Beethoven have a fairly ingrained performance tradition, due to their popularity. These aren’t the kind of pieces that demand a conductor re-invent the interpretive wheel. I would even argue that the best display of Lehninger’s chops was during Barber’s Overture, which is by far the least exemplary piece on the concert. Regardless, Lehninger’s work on each of the three pieces was well beyond impressive, and the audience gave him due credit. Followers of the BSO are unquestionably keeping a close and critical eye on its new conductors, and the official verdict is far from out on the newcomer. Nonetheless, it’s both comforting and exciting to see a promising new generation step up to the plate. Lehninger, Zukerman, and the Boston Symphony repeat this program on Friday at 1:30 pm, and on Saturday and Tuesday at 8 pm. To my non-professional ear and eye on Friday afternoon it seemed that Maestro Lehninger was as good as Mr. Lane found him on Thursday evening. I’ll be looking forward to a second hearing of the Barber overture this evening; and the “Mientkiewicz” concerto is always worth hearing. Peter, the “adrenaline was poured from every inch of the stage into the Finale”? Really? I know that it has become a fashionable to play the T5 last movement with a tempo of a turtle gallop but even if to accept this insultingly leisurely tempo then the last movement was no so exiting and nor particularly well played, at least on Saturday. The most parts of the symphony was about the BSO string sections (that did very well, particularly in second movement) were fighting with BSO brass. That was dramatic itself but it has nothing to do with Tchaikovsky’s symphony, though I admit that sometimes they did found each other for a short time. The subduction of the second movement orchestral opening and let the horn’s introduction of the main theme to play way too loud was unexpected but I kind of like the idea. The horn sounded like a lonely wolf and it was very different, pleasantly different, unfortunately it took a 1/4 movement to for the orchestra to balance itself back. Despite that BSO played this work zillion times but this one more concert reinsured my long-standing sentiment that BSO is not a good for Tchaikovsky 5. Even during the best BSO times, in 40s-50s, the Fifth Symphony was not the one where BSO shined. For the Fifth Symphony it needs to be a different Hall, different tone, all different play… The 4th symphony is the BSO’s symphony but for Fifth, in my view, it needs to be Vienna or Czech orchestras. BSO is trying to play Tchaikovsky as it is a Beethoven – a wrong approach, as I can see it. Thanks for the post, it’s good to see a dialogue come out of these reviews every once in a while. You’ll have to excuse my hyperbole. However, I should note that the energy level was indeed stemming from a forceful performance, not from a “fast” one (more often than not, the latter comes at the cost of the former). In my experience (based in modest knowledge of appropriate Tchaik performance practice, based mostly on conductors I have a lot of respect for), the “Turtle Gallop” is the appropriate tempo, and there seems to be an educated consensus on this. I’ve really only heard the breakneck tempo embraced by under-informed university/conservatory orchestras. Perhaps you could point me to some recordings which favor the brisker finale tempo over the more “brutally forceful” one. I think the issue of brass/string balance is rather contradictory to “playing Tchaikovsky like Beethoven.” I perceived these moments of imbalance as quite intentional, and it’s orchestrated that way. I happen to appreciate the BSOs aptness for precision that seems to be less-emphasized by Czeck or other Central or Eastern European orchestras (Czeck Phil/Russian national, etc). It may not be “Tcaik” as he intended, but it sounds pretty damn good to me. That being said, I claim no exhaustive expertise on Tchaikovsky, and must reluctantly admit that I’m in the camp of composers who tend to dismiss his existence more often than not. Peter, I do not confuse forcefulness and speed. I do not find the last movement of BSO’s Saturday renderation as “forceful”. I however find that the slow tempo made it almost meaningful in context of the symphony. If you are asking for recordings what I find the tempo is perfect that try the 1961 DG recording of Maravinsky and his Lengradand Philharmonic “under-informed” band. Maravinsky in my view absolutely “owns” the tempo of the last movement of the 4th and 5th symphonies. No one play sit today like this. Even Gergiev (who is very much NOT the conductor that I admire) when he accidently come up with the best ever first movement of the 5th symphony committed to public recording (live, with Vienna Philharmonic in 90s, available by Philips) he did not have guts to go for faster tempo in the last movement. The BSO under Lehninger on Tuesday evening played brilliantly…it was amazing. Everything was done with perfect balance, correct tempi etc… Zuckerman played with great technical skill but his performance left me cold. Lehninger’s most revealing ability is his absolute lack of ANY interpretive skill: one felt that a computer was the conductor. I have heard the Tchaikovsky 5th live about 30 times over the past 50 years.. to say this performance was DULL is an understatement…. It was staggeringly boring!